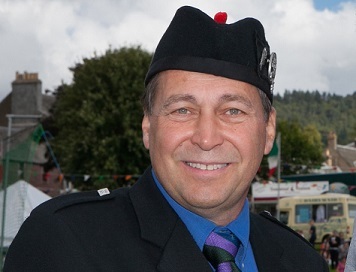 The Chieftain for this year's Crieff Highland Games has been annouonced. And the choice celebrates Crieff's long-standing relationship with its sister games in the USA. Crieff Highland Gathering chairman Ian Stewart said the Board of Directors of Crieff Highland Gsthering is delighted to announce that the Chieftain for 2018 is Mike Mihalic. Mike who hails from Ohio, has a close and long standing connection with Crieff Highland Gathering dating bsck to 2008. It was then that, in his capacity as President of Ohio Scottish Games, he established the twinning relationship with Crieff Highland Gathering, which he rates as one of his premier accomplishments amongst the many highlighted during his tenure as President there. The transatlantic relationship celebrates its 10th anniversary this year. CHG Chair, Ian Stewart explained "Initially formed to support each other's mission in the preservation of the Scottish arts it has done so much more than that with very close cross Atlantic bonds now formed between people in Scotland and the USA. It is fitting that in this the 10th anniversary of Ohio/Crieff twin/sister relationship that Mike should receive this honour. Myself as Chairman, the Directors of CHG and the people of Crieff look forward to welcoming him to our town and to our games."